There is a beauty to Novi Sad that reminds me so much of La Placita in Los Angeles; or La Plaza en Guadalajara, Mexico; or even La Plaza in Salamanca, Spain -- a place where people walk, gather, sing, enjoy each other's company late into the evening: children and their guardians, young and middle aged groups, the elderly-- all out for a stroll, or for a concert, or to ice skate at the plaza rink. People are talking to each other (not buried into their I-phones) in animated conversations, or sitting leisurely for a good long meal. I already know that when I return to the U.S., I will miss these evening walks, evening gatherings so typical of many places in Europe. 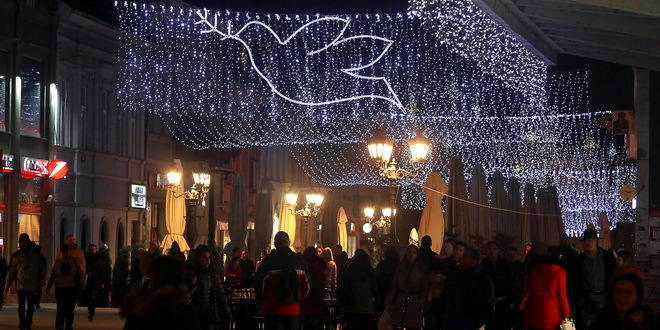 Tonight in Novi Sad, I strolled with friends at the plaza downtown after having taught my graduate course. Here in Novi Sad, the class I am teaching always meets on Saturdays from 4 - 7p.m., which emphasizes how the European system can be quite different. The university schedules graduate courses on Saturdays because graduate students (1) work during the week, and (2) often live far from Novi Sad. I have one student who travels by bus from Nis to Novi Sad -- a 5-hour bus ride. Also-- we do not meet every Saturday. This kind of schedule allows for the working student to manage a class schedule and it also demands much more self discipline and independent study. Because of this, I make sure to carefully plan our 3-hour seminar meetings. Tonight was special. First, my graduate student at The University of Nebraska-Lincoln (UNL), Visnja Vujin, was with us. She is from Serbia and received her MA at The University of Novi Sad before moving on to doctoral studies at UNL. She had arrived last week from Nebraska to visit her family for the holidays. It is because of Visnja and her Novi Sad professor (Dr. Aleksandra Izgarjan) that I am here. When Visnja entered our classroom and heard me greet the students with "Dobro Vecer!" she told me it felt really "surreal." 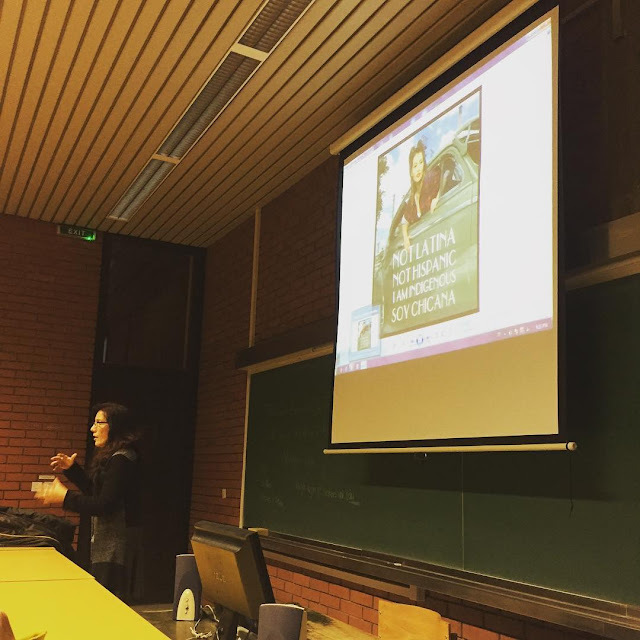 She said, "I was in this very classroom 10 years ago and to think that sometime in the future, I would be studying in the U.S., and that my U.S. graduate advisor/professor would be in this same Novi Sad classroom greeting the students in Serbian-- well it's just surreal." For me-- it was also an amazing moment--to stop and contemplate how connections are made-- how we can come together in friendship/community, to witness, "be a crossroads," by understanding and enlarging each other's worlds. I am profoundly moved even while typing these words, while also knowing that at this moment in our history, we are facing continued as well as new ruptures/global crises. But here, in this Novi Sad classroom on a Saturday late in the afternoon, we gathered as a community of intellectual learners/discussants. Our class meeting focused on Gloria Anzaldúa's Borderlands/La Frontera, and Eden Torres's theoretical text, Chicana Without Apology. Similar to the way I fashion my classes in the U.S., I work toward presenting and involving students in intellectually rigorous discussions, by making sure we connect the cultural, aesthetic historical, political relevance of the text to where students are in order to offer them various avenues "into" the work. Because Anzaldúa's Borderlands has been translated in over 30 languages, I already knew that this book has made connections with a multitude of communities/cultures. Yet tonight, listening to students making connections to their country-- listening to the painful history they have experienced in one way or another was profound for me. They are teaching me so much, helping me deeply contemplate-- at a most visceral level, their personal stories connected to their nation (once called Yugoslavia), stories about being torn apart in the most heart wrenching way in the name of nationalism. I heard a multitude of stories which all pointed to the consequences of adhering to a nationalist agenda. At times, the energy in the room created by the intellectual and emotional import of the discussion was powerfully evident. Toward the end, I included a picture (see above on the screen and a close-up below). This is a picture that was taken by friend, colleague, and fellow La Bloga writer, Olga García Echeverría in her own classroom at California State University Los Angeles (CSULA). Last week, she had her students create cardboard books with creative covers that reflected what they had learned in her class (click here for her La Bloga posting on her classroom work!). One of her students, Nancy Flores, re-created the Aztec mythological goddess, Coyolxauhqui (click here for more information), the moon goddess. 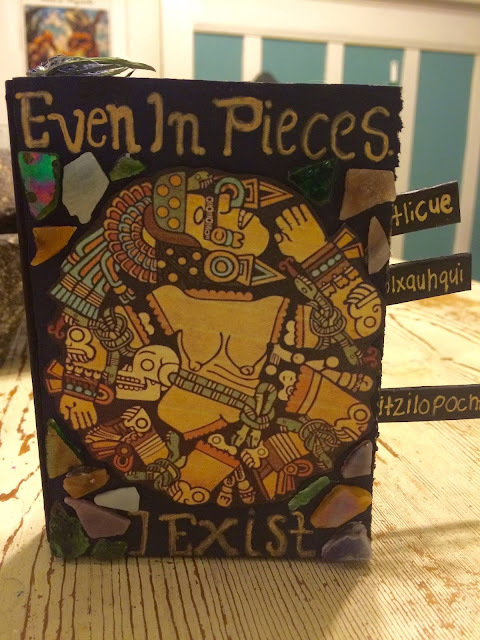 Olga's student writes, "Even in Pieces, I Exist." Hearing student stories tonight of dislocation, migration, a tearing apart of the home, of the heart-- I kept thinking of this important cardboard artwork a student had made in Los Angeles, how these resilient students from the "Former Yugoslavia" are still in the process of making meaning from so many pieces. I also think of Yesenia Montilla and her poem "Maps." And this I leave with you, dear La Bloga reader-- Montilla's poem, "Maps" and the hope that we can overcome and cross what separates us so that we may inhabit "La Conciencia de la Mestiza." Wishing all of you paz, fuerza, y luz! before we're done making it. expecting to be crushed by thirst. Thank you, Amelia! For giving us a window into your current home and for reminding us of those connections that exist across distances/borders/culturas. And thanks for including the picture of my student's cardboard book. Her name is Nancy Flores and she did an amazing job with the project. I will share this post will her to show her how far her work has traveled. ❤️❤️❤️ Also, love that closing poem by Yesenia.